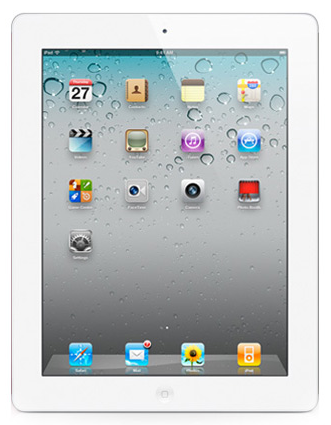 Can you see the most obvious difference between the iPad and the other two? 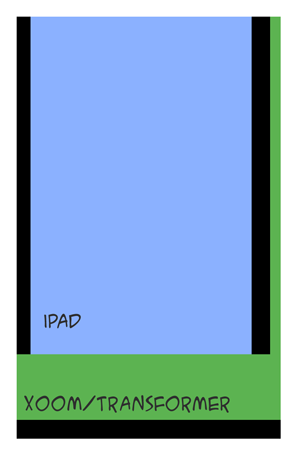 I made it easy for you by showing the iPad in the vertical position, because that’s its natural position: the home button is at the bottom, and the front camera is at the top. 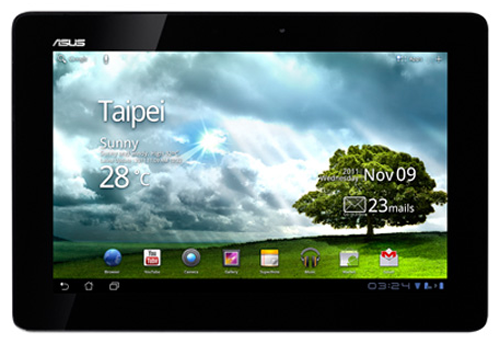 In constrast, the other tablets' natural position is horizontal, with their front camera and power/sleep buttons placed accordingly. Since reading a comic-book happens almost always in portrait mode, I figured I’d might as well choose a device that’s also designed for that orientation, if possible. Another important spec for me was the aspect ratio. 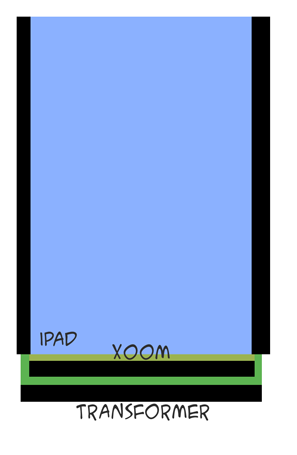 The iPad has a 4/3 ratio whereas pretty much every other tablet on the market has a widescreen ratio, most of the time 16/10 (which is the case for the Xoom and Transformer). I don’t know about you but holding a widescreen device vertically just feels wrong to me – it’s too narrow and too high, like I’m reading a mutated book. It’s entirely subjective, of course, and you may not mind at all. 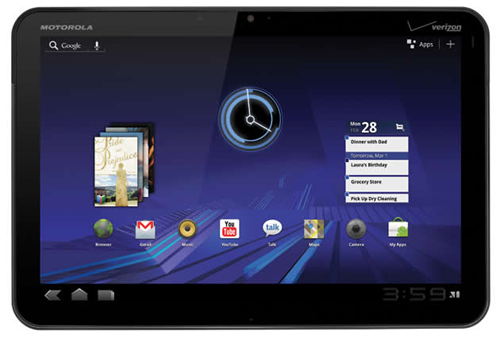 Xoom: 160ppi, 12.7cm x 20.3cm. Transformer: 149ppi, 13.6cm x 21.8cm. iPad 2: 132ppi, 14.7cm x 19.7cm. A standard American comic-book is 17cm x 26cm, so no tablet comes even close to reproducing that real-world reading experience (I wish somebody would make a bigger tablet! ), but you can still figure out which one gives the best reading experience. Here you can see that a comic-book displayed on a Xoom would be pretty much the same size as on the iPad – sure, you would get a better picture thanks to the higher resolution, making reading captions slightly more possible, but not any more comfortable without zooming a bit. The Transformer is clearly better here: the displayed page is bigger and it’s got a higher resolution to back it up. Help me get through my RSS feeds more efficiently. Let me read my Instapaper queue in a comfortable way. The sad thing is that Flipboard, on iPad, really blew my mind for reading RSS feeds, and there’s no good Instapaper client on Android yet. It was a tough choice, as I went back and forth for a long time between the iPad and the Transformer, but I picked the iPad in the end. I figured that the loss in the comic-book reading experience was not too bad compared to the significant advantages I would get on my other use-cases. There was of course the issue of my control over the device – something that always annoys me with Apple products (I ditched my iPhone for a Galaxy S Captivate because of that). But given my requirements, it wasn’t such a problem: both digital comics and RSS feeds are managed on the cloud, and most other applications did a good job of working around Apple by supporting 3rd party services like Dropbox for storage and syncing. If you have secondary requirements involving heavier stuff like music or video and you don’t like to play (pay?) by Apple’s rules, you may again want to choose the Transformer. Spending the money on the tablet was not too hard. I sold some of my collection (mostly single issue series I either planned to replace with TPBs, or get rid of altogether), and that alone pretty much paid for it. That’s how much comics surplus I have in my home, begging to get uncluttered through the sweet release of digital media!